Oreos are one of the most diverse cookies on the snack shelf. While most of us are accustomed to the traditional chocolate-cookie with vanilla-creme in the middle, there are literally dozens of other possible flavors that have been floated over the years, from Avocado Oreo to Firework Oreo. But today, Oreo may be prepared to top all of them ... by releasing a mystery flavor! Kathie Lee and Hoda try mystery Oreos: Can you guess the flavor? The totally mysterious cookie, which hits shelves on Monday Oct. 9, is a limited-edition treat that Oreo won't even explain to TODAY! The all-white package offers no clues as to what the flavor could be, because Nabisco wants you, the true Oreo fanatic, to guess what the flavor is. What is this cookie sorcery, anyway?! The cookie itself looks like a plain Oreo (albeit a Double Stuf one), but many people think it tastes like some kind of fruit-flavored cereal, a la Fruity Pebbles or Fruit Loops. TODAY's Kathie Lee Gifford and Hoda Kotb gave the mystery flavor a try and both thought it tasted like watermelon. "Some sort of a melon," Kathie Lee said. But Oreo already came out with a limited-edition watermelon flavor in 2013. 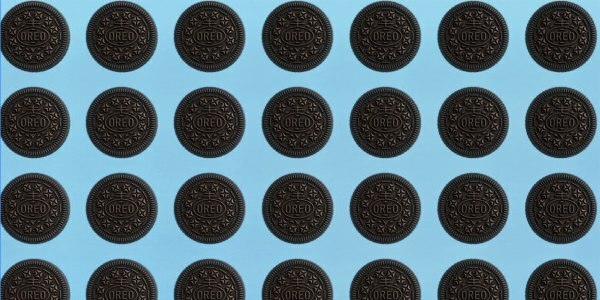 From Swedish Fish to Blueberry Pie, here are 20 Oreo flavors you probably didn't even know existed but now definitely need to try. Nabisco describes the cookie as the “newest, and spookiest, new limited-edition flavor,” which could mean the flavor is a candy-related to tie in to Halloween. Or it could be a combination of two of its previous limited edition flavors (maybe the watermelon flavor mixed with something else? ), because that's (sort of) how Dum Dums' mystery flavor is made: Instead of shutting down machinery and completely emptying out a batch's flavor, sometimes they'll just start a new batch, and, as a result, the two flavors will overlap for a little bit. You'll want to find out for yourself, of course, because in another bit of marketing wizardry the company is awarding $50,000 to the person who guesses the flavor correctly! You can submit your guesses at OreoMystery.com or by texting “MYSTERY” to 59526. Using your Oreo obsession to pay your bills? Now that’s the “Stuf” dreams are made of. A version of this story was originally published Aug. 25, 2017.